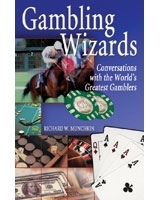 Richard W. Munchkin is the author of Gambling Wizards. Richard is a writer, producer, and director of film and television. His status as an expert-level backgammon player provided access to many of the world’s top players, from which he chose the eight subjects of this book. He lives in Santa Clarita, California with his wife and sons.